Two years ago, a six-year-old girl named Scarlett went to her first girl’s empowerment summer camp. But on the first day Scarlett’s best friend got mad at her after being left out of a game. In a moment of anger, she shared something private about Scarlett. "(The friend) told everyone at camp that Scarlett was a biological boy," remembers Sandra Collins, Scarlett's mother. Her daughter had gone to camp in stealth mode. Scarlett didn’t tell anyone that she was born a boy, that her parents had named her Ezra. After being outed, "Scarlett came home really sad, crying because she said, 'I don’t know how I’m going to go back because everybody knows I was born a biological boy even though I know I’m a girl,'" Sandra Collins says. Scarlett first started expressing her female gender when she was two, going off to preschool in boy clothes, then changing into spare clothes at school and coming home dressed as a girl. She transitioned fully to Scarlett at six -- going by that name all the time, using female pronouns in reference to herself and wearing girl's clothes. So when her friend told everyone at camp Scarlett was a boy, she was devastated, but only initially. "Scarlett, being the amazing, empathetic soul that she is," says Collins, "was able to go to camp the next day and go for the remainder of that week and the following week." Scarlett still plays with that friend today. This experience stayed with Sandra. She realized it’s a lot to ask kids to keep big secrets about identity. That's why last summer she started two day camps for transgender and gender fluid kids and teenagers where they can be themselves. No sneaking around; no fear of bullying. 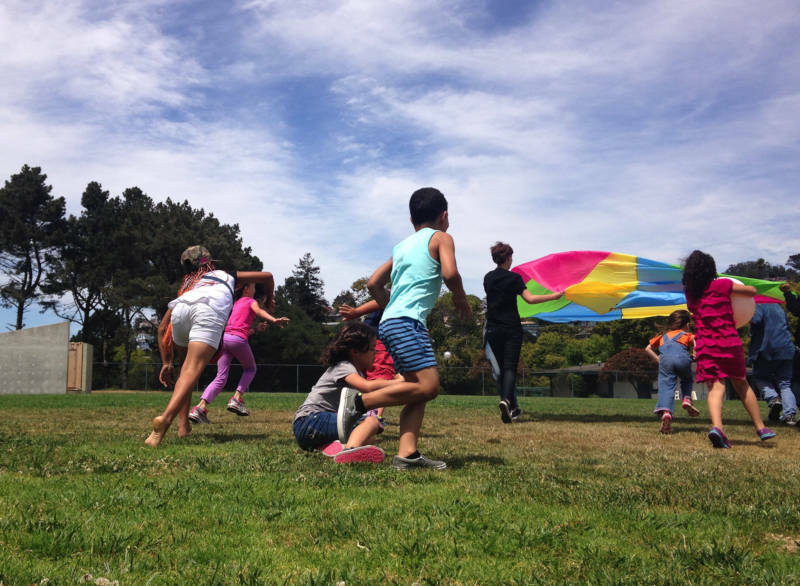 The camps -- Bay Area Rainbow Day Camp for kids and Camp Kickin' It for teens -- offer two week-long sessions in El Cerrito, outside San Francisco. 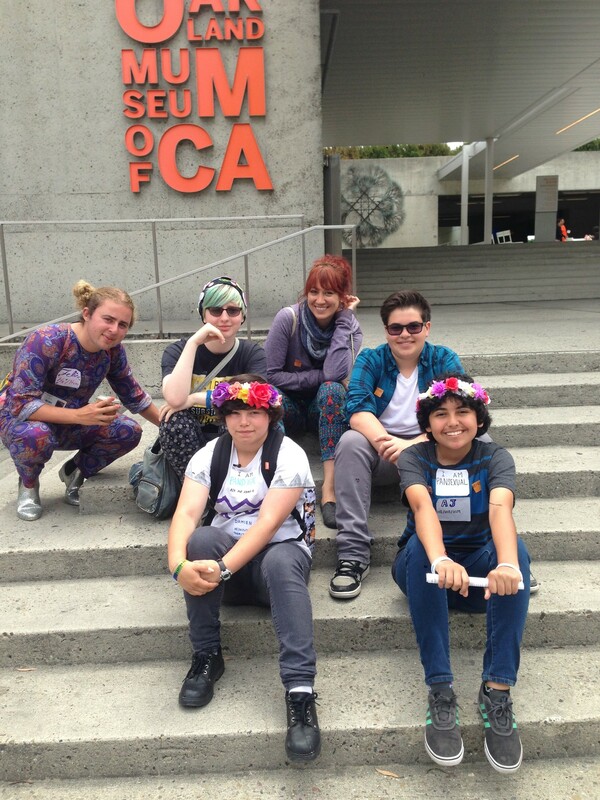 While there are a handful of overnight camps for transgender youth and their allies, Collins' camps seem to be the only day camps in the country. Scarlett, now eight, loves it. "It’s a place where gender creative and gender fluid people can have fun together," she says. That's the big picture. Actual day-to-day camp activities sound like pretty much any other camp. "We have snack in the morning. And then we also get to play on the play structure," Scarlett says. That very normal-sounding response is what camp director AK Kramer is going for. "It’s a very traditional camp. We throw water balloons at each other. We make art projects. I got pied in the face," Kramer says. "But because of our poetry unit or because of storytelling where all the stories we read are about gender creative kids, things really come up." When they do, the camp has therapists on staff who are ready to talk. Another benefit of camp is its positive role models. Camp director Kramer and many counselors are transgender, making it easier for campers to imagine what life would be like as a teen or a grown up. Kramer says even one week can have a big impact on kids' confidence. "They come day one and the kids are a little bit more reserved, and they’re not sure what to expect. By day four or five everyone’s in princess wigs, and they just are presenting much more how they see themselves," he says. "The parents are so moved by that and also I think really scared for their kids." That fear comes from a world that isn’t as kind as Rainbow Day Camp. Research shows transgender people have higher rates of depression, suicide, and homelessness among other things. There’s controversy about whether parents should let their kids transition to another gender, especially at a young age. But these parents have decided this is the best choice for their children. "There’s a quiet revolution going on here in the Bay Area in terms of allowing our children to transition so young," says Collins. "And we’re doing it very thoughtfully and mindfully." She points to a study released in the journal Pediatrics earlier this year. It says trans children who live as their preferred gender and are supported by their parents have the same mental health outcomes as other kids their age. In the past year, Collins has grown the camps into a larger nonprofit called enGender. The organization's goals are to support both trans children and children who do not identify as either gender, as well as their families. Part of enGender's work is running a monthly playgroup. Kids meet in a school library in El Cerrito where they jump around on large blue foam blocks or work on art pieces. While the kids play, parents meet separately in a formal support group. Topics range from navigating school systems to self-care. This network has really helped parent Nancy Brunn. "There is a time you have to get past the fear for them to be able to really appreciate the incredible gift that it is to have a child that’s gender expansive." Brunn and her kids never miss playgroups, even though they live a 45-minute drive away. Brunn's eight-year-old twins also went to Bay Area Rainbow Day Camp last summer. While one of her twins is transgender, the other isn’t, but embraces her role as an advocate. "For Pride weekend she made a sign that said, 'I love trans,'" says Brunn. "She had just completed kindergarten so just beginning writing, and that was what she wanted to write." 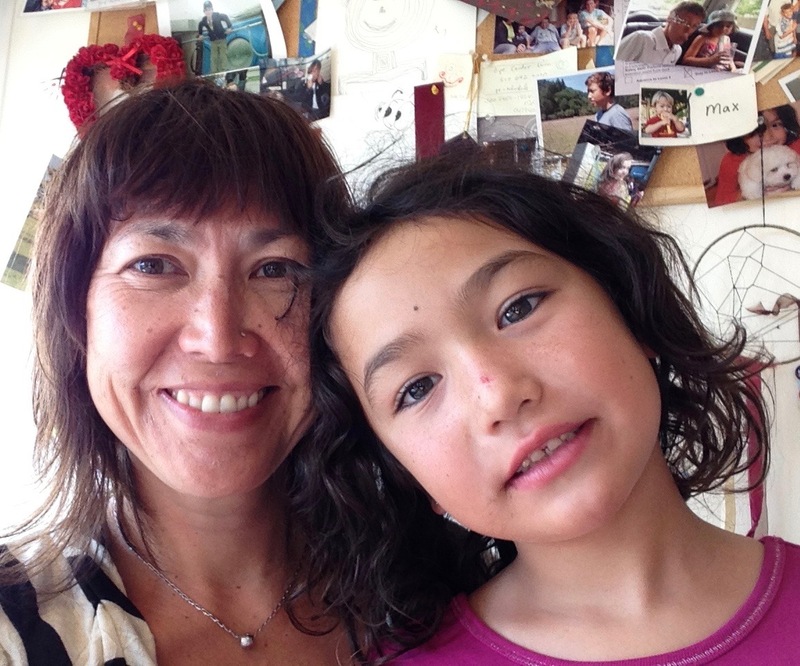 Today, eight-year-old Scarlett is speaking up for transgender issues, too. Last year when her teacher talked about transgender awareness, she felt shy and left the classroom. "But this year she raised her hand and (said), 'I’m transgender and my job is to educate people on how to have empathy,'" her mother says, while growing emotional. "That’s when I realized she had pride, right?" Sandra Collins' camp starts at the end of June. Eventually, she hopes Bay Area Rainbow Day Camp won't be so unique. She wants this model to grow so transgender kids across the country experience camp the way most of us do: as a safe, fun, and sometimes crazy place.